DNA (cytosine-5)-methyltransferase 3A (DNMT3A) is required for genome wide de novo methylation and is integral for the formation of DNA methylation patterns during development. DNA methylation is coordinated with methylation of histones. DNMT3A modifies DNA in a non-processive manner and is involved in the methylation of CpG island as well as non-CpG island. 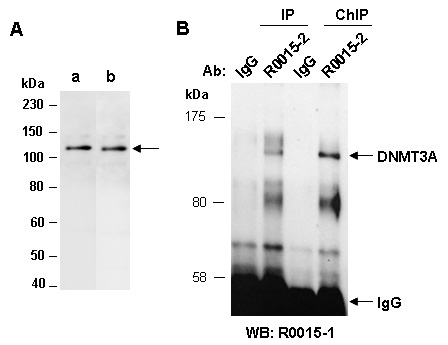 Rabbit polyclonal antibodies were produced by immunizing animals with a GST-fusion protein containing the N-terminal region of human DNMT3A. Antibodies were purified by affinity purification using immunogen. Supplied in 1 x PBS (pH 7.4), 100 ug/ml BSA, 40% Glycerol, 0.01% NaN3. Store at -20 °C. Stable for 6 months from date of receipt. *: The apparent protein size on WB may be different from the calculated M.W. due to modifications. Fig 1. (A) Western blot of total cell extracts from mouse thymus, using a. DNMT3A(N2) (R0015-1) or b. DNMT3A(N) (R0015-2) at RT for 2 h. (B) Total extracts from mouse thymus were immunoprecipitated (IP) with IgG or anti-DNMT3A (N) (R0015-2) under the conventional IP conditions or cross-linked chromatin immunoprecipitation (ChIP) conditions; followed by WB with anti-DNMT3A (N2) (R0015-1) at RT for 2 h.
Copyright © 2010-2019 Abiocode. All rights reserved.